Welcome to the online Exhibitor Service Manual for the FIG Working Week 2019 Exhibition. This web site is for participating exhibitors in FIG Working Week 2019. Within this site, you will find everything you need to successfully participate in this exhibition. We have lined up a team of industry professionals to make your exhibit experience a smooth process. Please take the time now to review this site carefully. The exhibition will be held on the 2nd and 3rd floor. 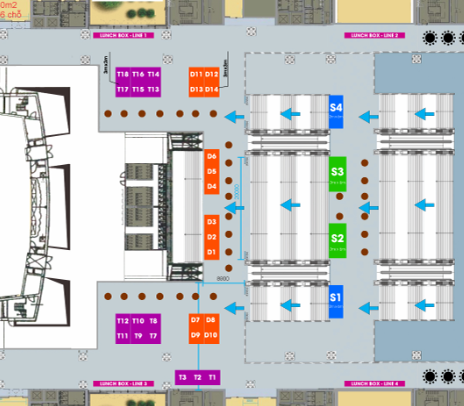 The FIG Working Week 2019 Exhibition will be held on the 2nd and 3rd floor at the National Convention Center. The official opening of exhibition is Tuesday at 10.30 immediately after the Opening Ceremony by the FIG President and the VGCR President. All exhibitors must keep their display open and manned during the entire show from Tuesday to Thursday. PLEASE NOTE: All contractors and their staff must wear badges when being in the exhibition hall at working time. Contractor/installation badges will be numbered. If there is any violation of the rules and regulations, the badges exhibitors / contractors must take full responsibility in all cases. Contractor/installation badges can be used during the building-up and dismantling period only. Information on registration will be sent to each company. Additional exhibition passes are available for purchase at 150 EUR per person. Exhibitors are urged to pre-register to avoid time-consuming registration lines. Exhibitors are requested to register online by 20 April 2019. TThe exhibition passes can be collected from the onsite registration area from Monday 22 April. Exhibitor registration at FIG2019 will operate on a "print-on-demand" basis. Badges will only be distributed to the persons whose names are on the badges (identification required). After Loading, all contractors must park the vehicle at Parking Area. On 22 April 2019 all exhibitors shall use the main entrance. FASCIA BOARD - 30 cm. height and 3 m. length to the outside, on each open frontage, comprising an aluminum frame. Fascia board and lettering will carry the exhibitor's name in English only (with blue ground, white letter). 2.1.1. No additional decoration or free-standing fitment may exceed the height of 2.50 meters from the floor or extend beyond space rented as specified in contract. This includes company names, towers, balloons and logos provided by Exhibitor. 2.1.2. No additional booth-fitting or display may be attached to the Shell Scheme structure. Neither nailing nor drilling will be allowed on the shell scheme structure or on any structure of the exhibition hall building. If certain accessories including stickers and hanging need to be affixed, please consult the Official Stand Contractor. 2.1.3. No painting or wallpapering including stickers on the Shell Scheme panels will be allowed. Exhibitors who wish to have the panels painted must inform the Official Stand Contractor for quotation. 2.1.4. Any change in color or type of fascia and floor covering must be carried out by the Official Stand Contractor, after discussion with the Organizer. Changes will be at Exhibitor’s cost. 2.1.5. 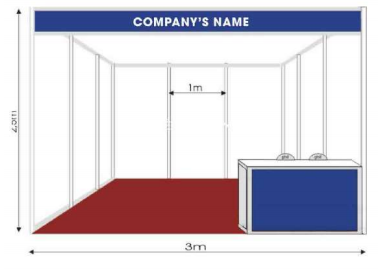 An Exhibitor occupying a corner booth will have an additional open side with a fascia, complete with name and booth number, at no additional cost. 2.1.6. Logos may be attached onto the fascia, but MUST NOT bigger than 30 cm x 30 cm x 1 cm (thick). The cost of reproduction is borne by the Exhibitor. 2.1.7. No suspension from the ceiling of the Exhibition Hall should be made, nor should any article be fixed to the floors, walls or any part of the building. 2.1.8. All light fittings and socket points must be ordered from the Official Electrical Contractor. 2.1.9. No financial credit will be given by the Organizer for any shell scheme package item not utilized. SAOLA has been appointed as the Official Contractor. 91 Tran Hung Dao Str, Hoan Kiem Dist, Ha Noi. PLEASE NOTE: All electrical works including lighting, power points, switch-box, electrical wiring, water supply and drainage works must be performed by the appointed official contractor exclusively. Exhibitors using other contractors to work on site should notify the organizers in advance and submit the full details of the contractor for approval. Dimensional drawing of special design must be sent to the organizer for approval before performance. 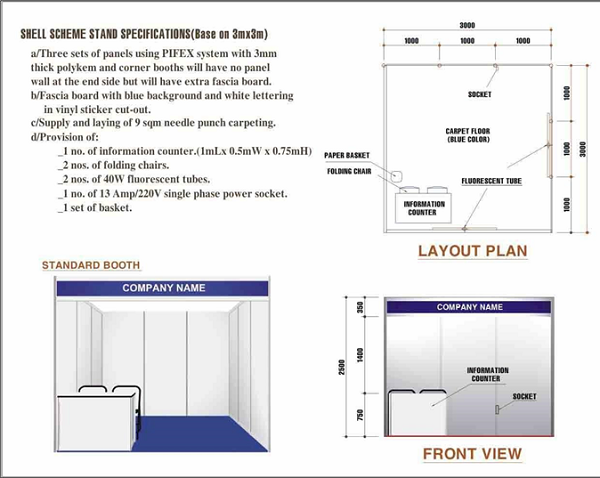 Prior to commencing any construction, decoration or adjustment of the exhibit site, the exhibitor is required to submit construction plan (with 2 copies) to SAOLA EXHIBITION DECORATING AND SETTING UP JS. CO(SAOLA) within 31 Mar 2019. All construction must be operated according to the plan that was approved by SAOLA. SAOLA will use a first- come- first- serve basis in approving the plan. Floor and wall plan, with grid line, clearly showing dimension numbers (Minimum scale 1:100). Front, top, and side view clearly picture showing dimension numbers (Minimum scale 1:100). Perspective view with details on the material to be used. Stage and sound equipment plan. Electrical equipment and lights plan. Note: In case SAOLA does not receive all the specified plans (1–5), SAOLA will not approve the construction plan. The organizer will approve the construction plan and will inform the exhibitor case by case. SAOLA reserves full right to adjust any construction plan in a way that will not create a disturbance to other exhibitors. In case the construction plan must be adjusted, the exhibitors will need to return the adjusted plan back to SAOLA for re-approval within 4 April 2019. If exhibitors fail to submit the construction plan within deadline, SAOLA has the right to disallow contractor to build up booth on the above schedule. The exhibitor cannot use his neighbor’s panel. If his own panels are higher than the booth nearby, he must make his panels look neat and nice. The overall height of stand in exhibition must not exceed 5.00 m. and a double-story booth is not allowed. The raw space exhibition stand must have a fascia or a sign that is clearly showing company name and booth number. If there is any unclear sign, the organizer reserves full right to provide a proper fascia, which exhibitors must take responsibility for any expenses that might occur. Exhibitors will take full responsible for any loss or damage occurring from their staff or from their contractor’s staff and must act as the coordinator if such a situation occurs. For security reasons, if any exhibitors wish to use electric light, please contact SAOLA for electrical service. Exhibitors are not allowed to use electric supply for machine as electric light in any case. Hanging on the ceiling is not allowed. Sawing, cutting, spray painting, roll painting, puttied and abrasive paper are prohibited in the 2ndFloor of the Hall. In case exhibition booth is decorated with balloons, they can be filled with inflammable helium only, and exhibitors must inform the organizer at least 10 days prior to the show day. Ms. Huong My Nguyen will be able to help with an extensive range of additional furniture and equipment for your booth if required (tables, chairs, brochure racks, carpet squares for flooring, audio visual equipment, extension cords, pot plants, signage).